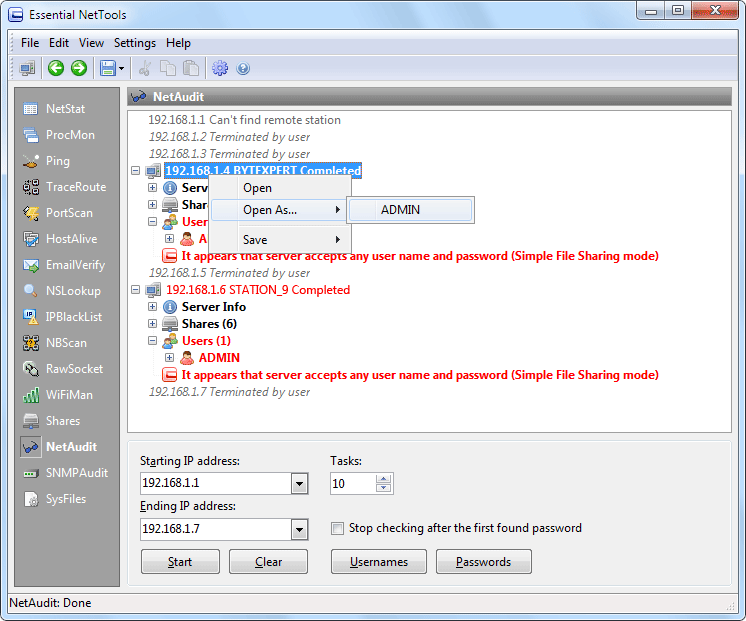 NetAudit (NetBIOS Auditing Tool) is a tool for auditing networks and individual computers running NetBIOS file sharing service. This tool was originally written many years ago as a GNU command-line utility and became very popular. Our tool was written from scratch, but it was inspired by this popular utility. Despite the fact that very powerful and expensive solutions exist to check hundreds of potential loopholes in a network, most security problems stem from incorrect configuration of NetBIOS resource sharing. With NetAudit you can easily audit your network and/or individual computers. Remember that you must obtain the permission of the network's administrator before auditing the network. Before you start auditing, you should enter the starting and ending IP addresses in the Starting IP and Ending IP fields as shown above. Please note that the first 3 octets of the starting and ending IP addresses should be the same. You can customize the username and password lists by clicking on the Usernames and Passwords buttons correspondingly. These lists are used to check the possibility of potential intrusion, and you can customize them based on the name table obtained by NBScan or any other considerations. A null password is always added automatically as the first password to the list, because it is non-printable; however, it is often a good password to try. All supplied passwords are tried for all usernames. If you have previously modified the lists, you can restore the default values by clicking on the Restore Defaults button. You can set the number of simultaneously audited addresses in the Tasks field. You can also limit the audit of the individual host to the first successfully retrieved password by checking the Stop checking after the first found password box immediately. This will allow you to stop searching for other passwords and proceed to the next IP address immediately. To start auditing, click on the Start button. You can stop the process at any moment by clicking on the Stop button. Remember that auditing a computer is a lengthy process that depends on many factors, and you should be prepared to wait for a long time, especially if you set a wide range of IP addresses. When NetAudit detects a security flaw in the computer being audited, an alert sound is played and the tray icon starts blinking. · Copy – copies selected text to the clipboard. · Select All – selects all text in the window. · Save – saves the log to a file.